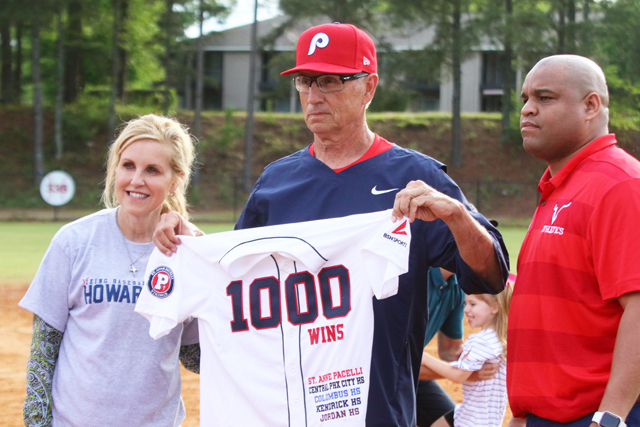 Saint Anne-Pacelli coach Bobby Howard earned his 1,000th career coaching victory Monday evening. COLUMBUS -- The rain stopped for a few hours and the sun even peaked through for a few moments. It remained dry long enough for Bobby Howard to lead his Saint Anne-Pacelli Vikings to an 8-3 victory over Webster County Monday afternoon at Britt David Park. It wasn't just a normal win, Monday's victory was Howard's 1000th career victory and it came in front of a large crowd of supporters, former players and friends. "I've had a lot of good players over the years," said the humble Howard, who seemed out of his comfort zone as cameras photographed his every move. "No coach has ever won anything without great players. To tell you the truth, I'm glad it's over. Now we can get ready to play a big region game tomorrow." Reliever Peyton McLemore shut the door on Webster with a 1-2-3 seventh, and Caleb Watson gave the Vikings (15-7) some breathing room with a three-run homer. But the day clearly belonged to Howard. McLemore said he's learned Howard's "no non-sense approach" to playing the game. "That's the reason he's been so successful," McLemore said. Howard is the first high school baseball coach in Georgia to reach the mark and according to the National Federation of State High School Association records, he is the 22nd coach nationally to record 1,000 high school victories. His career record is 1,000-303. The legendary coach is in his first season at Saint Anne-Pacelli, a private Catholic school in Columbus. He has also coached at Jordan, Kendrick, Central-Phenix City (Ala.) and Columbus High School, the latter where he spent 31 seasons and guided the Blue Devils to 12 state championships and won 819 games. Assistant coach Jeff Boatner also played under Howard and was just as excited as the heach coach. "He's definitely been blessed with a lot of good players and supporters," Boatner said. "1,000 wins, I'm blessed to have been a part of that as a player and coach. I'm happy for him." Howard's resume also includes eight state runner-up finishes as well as 29 region titles during his tenure with the Blue Devils before abruptly retiring three games into the 2015 season. He spent the 2016 and 2017 seasons across the Chattahoochee River in Phenix City. He led the Red Devils to state playoff appearances both seasons and led the school to a region title in 2016. On June 22, 2017, Howard accepted the head baseball coaching position at Cartersville High School before later resigning. He took off the 2018 season. But on May 7, 2018, he was hired to lead the baseball program at St. Anne-Pacelli. The longtime skipper has more than 1,040 career victories. In 1997, Howard stepped away from high school coaching and led Middle Georgia College for one season, guiding the Warriors to a state junior college championship. He won more than 40 collegiate games that season. In 2017, Howard was inducted into the American Baseball Coaches Association Hall of Fame and the BCA Hall of Fame in 2018. He is also a member of the Chattahoochee Valley Sports Hall of Fame and the Sunbelt Classic Hall of Fame. He has also been inducted into the Columbus State University and Jordan High School Halls of Fame as a player. A graduate of Jordan High School, Howard has sent a wealth of talent to college and many were drafted. One of his prized players is Major League Baseball Hall of Famer Frank Thomas, who singled out Howard for his influence on the 19-year veteran. Current Albany State head coach Scot Hemmings, who guided Darton College to the Junior College World Series in 2016 before the school merged with Albany State, is another of Howard's former players. He couldn't have been happier to see his former coach reach the elusive coaching plateau. "When you think of high school baseball, you instantly think of Coach Howard," Hemmings said. "He set the bar at such a high level with the program he built and the number of championships he has won. I am very grateful for the opportunity to have played for him, as I have carried what I learned at Columbus High into my coaching career and I give him a lot of credit for teaching me what I know today."